Clouds exhibit different forms and shapes. Some are stunning, others seem frightening, while several are peculiar. A good example of distinctive clouds is radiatus clouds. This is a cloud variety well regarded by cloud spotters and even photographers. Let us take a closer look at this kind of cloud phenomenon. Radiatus clouds are clouds showing extensive parallel bands or are placed in parallel bands that seem to come together towards one common point in the horizon. The cloud is named from the Latin word radiatus which means radiating, and appears with different cloud types. It tends to resemble the undulatus cloud variety wherein the cloud elements are arranged in rows forming cloud bands. However, undulatus clouds form perpendicular to the wind flow, while the radiatus clouds develop parallel to the direction of the wind. These clouds usually appear in the stratiformis species, which means that the cloud elements stretch out horizontally in layers or sheets. They are found in an assortment of cloud genera such as cumulus, stratocumulus, altocumulus, altostratus and cirrus. When large cottony and puffy cumulus clouds are arranged in parallel bands and tend to meet at the horizon, they are in radiatus form. Radiatus clouds in the cumulus form are often referred to as cloud streets that fill glider pilots with much excitement as they serve as the pathways of lifting air in which the glider can gain altitude. The radiatus cloud in this variety takes the form of low and unevenly shaped stratocumulus clouds converging in the horizon. Altocumulus Radiatus clouds appear as small and cottony clouds found at middle altitudes with small portions in gray hue. Altostratus radiatus are gray-toned clouds stretching out hundreds of miles, forming parallel bands that seem to meet at one point in the horizon. 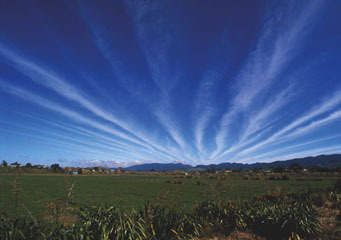 These clouds are arranged in parallel bands while some parts are made up of either cirrostratus or cirrocumulus clouds. Cirrus radiatus is sometimes called jet stream cirrus because it forms at the upper part of the troposphere and occurs as a result of jet streams encircling the globe in middle latitudes. This is the most dramatic formation of radiatus clouds. At What Height is Radiatus Clouds Found? Radiatus cloud appears in three cloud levels; low, middle and high. It emerges with stratocumulus and cumulus clouds for low level clouds at elevations about 6,500 feet from the ground. On the other hand, it develops with altostratus and altocumulus for middle cloud level at elevations anywhere between 6,500 feet and 20,000 above the earth’s surface. Lastly, when it appears with high level cirrus clouds, radiatus is found at altitudes more 20,000 feet from the ground. Depending on which cloud level they appear, radiatus clouds can be made up of water and ice crystals. How do Radiatus Clouds Form? Radiatus form due to atmospheric convection. In atmospheric convection, the warm air rises because it is less dense while the cool air sinks making the ambient air unstable. As moist air rises, it expands and cools forming into clouds. The wind drives the cloud along and new clouds are formed behind it forming a row. What do Radiatus Clouds Look Like? Radiatus clouds appear like bunch or rolls of clouds arranged in long lines, stretching to the horizon that seem to converge in one point similar to railway tracks. It should not be confused with the undulatus variety because it is arranged in parallel bands not perpendicular. How common are Radiatus Clouds? Radiatus clouds are common in most parts of the world but they frequently appear in middle latitude regions where low-level air often becomes unstable as a result of warm air colliding with cool air. Take time to observe the clouds daily. You might be lucky enough to witness the gorgeous radiatus clouds appearing in the sky.